I won't cover every step in the manual, but I'll try to hit spots that give folks a rough time. 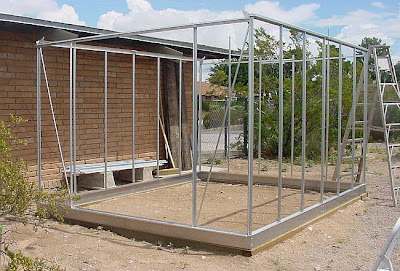 First, it's best to assemble this frame on a day without wind. 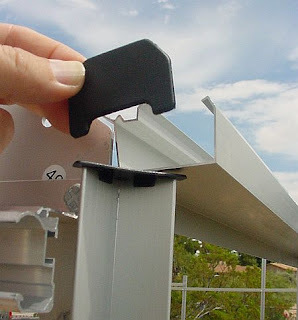 Second, throughout the kit, the bolts are inserted so the head is on the outside of the greenhouse, and the nut is on the inside of the greenhouse. 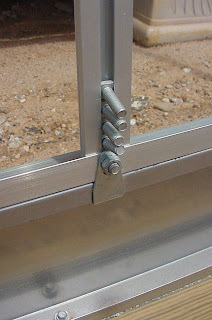 This allows the panels to lay flat against the bolt heads on the outside of the greenhouse. The floor plates (Parts 1,2,3,4,5,6) get assembled and sit on top of the steel base. It seems like they should get bolted down somehow, but they don't. 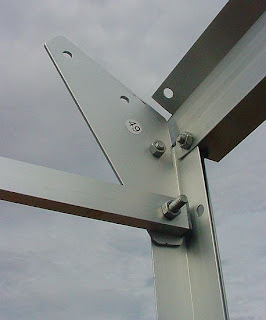 They're basically "clamped" to the steel base by the small Hold Down Connectors (part 47) that you'll use at the bottoms of the corner posts and wall studs. It's easy to get confused about how to orient the four corner posts (part 7). Each post has a total of two holes drilled in one end, and a total of four holes drilled in the other end. The end with two holes goes down, and the end with four holes goes up. 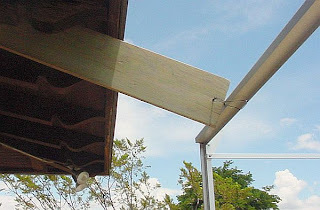 Each post is oriented so the two flat flanges point towards the greenhouse, and the two flanges with folded-over edges point away from the greenhouse. The photo above shows a corner post from the outside. Now comes a case of "do as we say, not as we did." When the corner posts went up, they were wobbly. They got even more wobbly when we added the weight of the ceiling plates to the top, which is the next step in the manual. Then a breeze sprang up, and the structure got very unstable. Running, yelling, grabbing of posts. 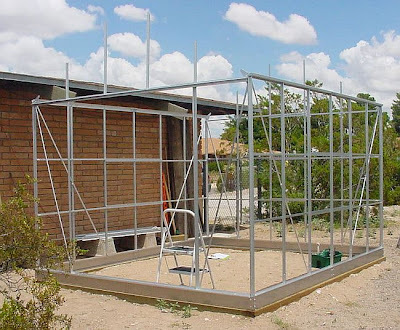 To prevent damage to the frame, we anchored the structure to our nearby house rafters with scrap wood and wire. 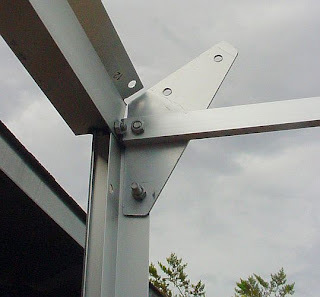 TIP: As you put the corner posts up, temporarily attach the diagonal braces (parts 79 and 80) for stability. Have a look ahead at page 11 of your manual. See how the diagonal parts 79 and 80 are attached to the top of the corner post, and to the base? Put them in place now; attach a part 79 AND a part 80 to each of the four corner posts. The aluminum this kit is made from is quite soft (softer than the stock aluminum the box stores sell, for example.) It's possible to for the posts to bend if they're allowed to fall over under stress. That way you won't have to do anything that looks as silly as our baling wire solution above. On page 7, assembling the pieces for the front ceiling plate (over the door) is confusing. You assemble them on the ground first. To figure out which side is up for each piece, it helps to look at the drawings in the parts list on page 19. If you orient the pieces like they look in the parts list, the directions make (a little) more sense. The photo above shows how the ceiling plate looks installed. The flat side of part 48 will be against the rear braces, and part 48 will be on the outside of the greenhouse. 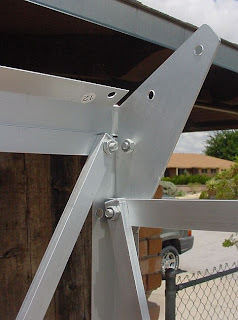 Use long bolts in the holes of the Stud Connectors to attach the Rear Braces together, and use a strut bolt (part 78) in each end of this long assembly. When it’s assembled and installed, it looks like this (standing inside the greenhouse.) But there's a problem…let's call it a Bad Design Alert! The instructions tell you to fasten both ends of this Rear Brace assembly to the bottom hole of the triangular Corner Bracket (49) at the corner posts, as shown to the right. This doesn’t work well. 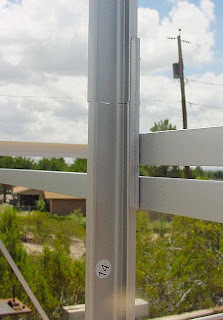 One end of this newly assembled bar is higher than the other, so to keep things level, the attachment point on one side should be slightly higher than the attachment point on the other side. That’s logical, right? Well, unfortunately, you can't attach this in a logical way. You do need to use the bottom hole on the Corner Bracket, just as the instructions say, on both sides. This means that the whole assembly is be rather unlevel. It looks a bit odd, but it does work. In case you're as stubborn as I am, let me save you some time. We tried to correct this dumb design by attaching one end of the assembly to the bottom hole of the Corner Bracket, as in the photo above. On the other end, we thought we were being brilliant by ignoring the directions, and attaching it to the corner bracket using the second hole up from the bottom, so it looked like the photo to the right. Great! This makes everything nice and level all across the back wall. But it won't work. The problem is, a few steps later you’re attaching Side Diagonal Strut (part 80) onto the same corner bracket area, and it simply won’t fit if you use the second hole for part 31 as we did to the right. So, defeated, we had to attach both ends to the bottom hole on the Corner Brace, as shown in the photo to the right, just as the instructions directed. So, this is how the back left corner is supposed to look, even though it does make the rear brace assembly look unlevel. Once you get this assembly attached at both ends, using the bottom hole in the Corner Brackets, you can loosen the bolts and wiggle things around so they look more level. 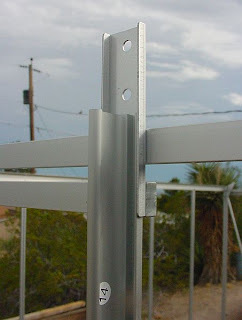 The aluminum bracing has enough flexibility to be a little forgiving. One more tip about this pesky area: when you start attaching the back wall studs to this Rear Brace assembly, the studs slide into the Stud Connector (47). One stud slides up from the bottom, and a short stud slides down from the top. The Stud Connector joins the two studs into one. When you slide the bottom stud into place, position it so it only covers up (roughly) the bottom two holes of the Stud Connector. You’ll need the top half of the Stud Connector clear to accept the other stud. Here’s what it looks like after the bottom stud is in place, standing outside of the greenhouse. By the we had this Rear Brace assembly all assembled and wiggled around so it didn’t look as obviously crooked, the joint between the two studs actually ended up a bit higher than halfway on the stud connector, as you can see in the photo to the right. One person I read about decided to discard this whole Rear Brace assembly and bought a 10 foot wide piece of aluminum angle iron to use across the back wall instead. After wrestling with the design problems of this back wall area, I can see the benefits of that idea. However, it is possible to get the pieces together so they'll do their job...it just looks kind of funny. Now, on to Assembling the Wall Studs (page 9) And The Famous Bolt Quantity Error! Page 9 contains an error that's caused much aggravation. 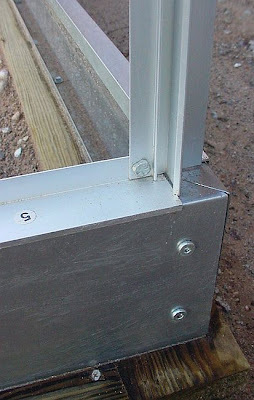 This page explains how you attach the wall studs to the top and bottom of the frame. As you attach each wall stud, you include extra bolts in the track that “float” until they’re used to secure braces you add later. The error is in the bold note marked “IMPORTANT:” by the Figure D illustration. It tells you how many of these extra bolts to insert in each wall stud, but the quantities are wrong. Basically, the instructions tell you to insert fewer long bolts than you'll really need. If you follow the instructions as shown in the manual, you will have to take things apart later to add more bolts to many wall studs. Arrgghh! In earlier kits, they didn't even include enough long bolts to complete the construction. People had to go buy more. In my kit, I had exactly enough long bolts to complete the construction, so they've probably started correcting the number of long bolts shipped in the kit. However, if you have the 05/06 manual, they have NOT corrected the instructions that tell you where to use them. Nice, huh? So, I made a list of the correct number of bolts needed to install with each wall stud, referring to the illustration on page 9. I kept that list with me as I put up the wall studs. That list is shown to the right, and you're welcome to copy or print it. It's pretty ugly, but it should prevent you from needing to take things apart later to add more bolts to the wall studs. I wrote these bolt lists to read from the top of the stud to the bottom. 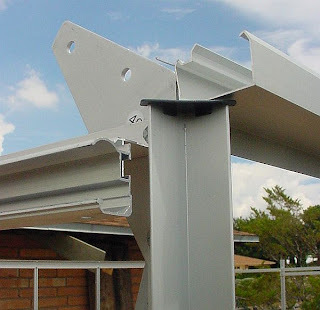 In this list, (SH,L,L,L,L,SH ) means a short bolt attaching the top of the stud, with four long bolts floating, and a short bolt attaching bottom of the stud. TIP: Since you’re sliding bolts into the tracks in the wall studs at this point, you could also include extra bolts that will remain free-floating in the track. If you plan a bit, you could use these to attach brackets for shelves or other things. Frankly, my brain cells were dying by this point, and I decided just to get the walls up and use T-bolts for greenhouse enhancements later. But, it really is a good idea, and lots of people have been bright enough to take advantage of it. TIP: As you install each wall stud, you can also install the small Hold Down Connector (part 47) at the bottom of the stud. Oddly, the manual has you go back and add these parts later in the process (unscrew the bottom nut, add the part, screw it back). This is silly. There’s no reason not to do it now, and it saves you a step later. The photo to the right shows how you attach the bottom bolt through the Hold Down Connector (part 47) and leave various additional bolts "floating" in the groove above. The additional bolts (of varying lengths, depending on which stud you're working on) are ready to be slid up the track to install braces later. The wall studs are up, and the front diagonal braces are in place, on either side of the door area. Tip: Before you start adding the horizontal wall braces (parts 30,31) it's a good idea to stop and check again for squareness. You can measure diagonally from corner to corner inside (hopefully the measurements are equal.) We also used a level on each corner post. You can loosen bolts to make adjustments as needed. Frankly, you can't check for squareness too often. It's much easier to correct a bit as you go. Remember when I mentioned that Harbor Freight keeps making changes to this kit? Here's one. 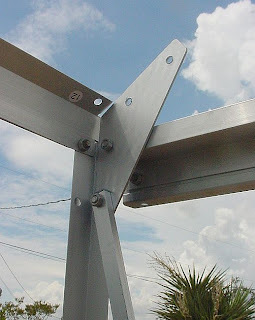 Apparently there are older kits out there with Diagonal Struts (parts 79 and 80) and Horizontal Braces (parts 30, 31, 32) that are shaped like like angle iron, with one large flat side and a small flange on one edge. And, there are newer kits out there with Struts and Braces that are made of hollow stock that's rectangular in cross section, with little plastic caps on the ends. I have the newer type, as shown above. Who cares? Well, the angle type is thinner, so it can be fastened with short bolts, but the thicker hollow type (like mine) requires a long bolt. This means I have to use longer bolts than the manual states, at every point where a Diagonal Strut is attached. Joy! In my drawing of which bolts to use for the wall studs, I assumed you have hollow Diagonal Struts shaped like mine. If you have the thinner angle type instead, it should still work; you'll just have some bolts a bit longer than you really need, at the bottom of a few studs. TIP: See the little sticker with an arrow on Part 30 below? When you assemble the Part 30 braces, point the arrows into the corners of the greenhouse. If you don't, the holes won't line up correctly. Page 10, step 8. The black plastic Gutter End Caps (part 73) snap on the ends of side ceiling plates, leaving a small gap for the water to flow out. I see other people have used these, but on my kit, the gutter walls on the ceiling plates are spread too wide to fit the dinky plastic pieces. The plastic pieces keep popping off. We could probably bend the gutters to fit, but I think the small water gap in the plastic caps would probably get quickly clogged anyway. Fearing standing water in the gutters, we just left them off. Here’s how the structure looks with the walls up, and wall struts and braces in place. Click here to go to Part Four: Assembling the Roof, Windows, and Doors. OK, I am doing this myself, by myself. I got this far OK. I called in a few of my neighborlady friends today to help set the roof beams in place. I set the windows in while on the ground and taped them closed. It took all five of us to do it, lol. I am setting this on my back padio deck. Houston I have a problem. Everything snapped into place but the last corner and one post, number 20. I checked level and square again and forced the piece together after lossening the bolts all around the area. Now the 80 and 79 braces are a half inch too long. I forced them in place. Did I screw up? Also, I am not sure I have the door jams correct. Numbers 32 are not going in straight. Is there a picture here, I missed of the bottom of piece numbers 28 or 29 by the 1a or 1b plate. Thanks for much for doing this. So far, I think I am doing good .... right? Thanks for your kind words. I agree that pictures are worth a thousand words. I’m sorry there are apparently no cameras in China, where the manual was written. A few key photos added to the manual would save all of us a few gray hairs! There is a short bolt at the top of parts 16 and 17, and you’re correct that a long bolt is needed at the bottom, where the bolt also goes through the bottom of the diagonal brace. I now see that my drawing is confusing on this point. I tried to consistently use the order of "top to bottom" in my bolts list, so "SH,L,L,L" means Short at the top, then three more Long bolts beneath that. However, the way I oriented (scrawled) that handwritten list at the top of the illustration makes it look like the bolts should be installed in the reverse order, with the short bolt at the bottom. I appreciate the heads up, and I’ll try to see how to make that more clear. Thanks! Hello Oldma, I DO think you’re doing good, especially since you’re doing it by yourself, and I was fortunate to have the good help of my patient and capable husband every step of the way. However, I’m worried that things don’t sound quite right; you shouldn’t really need to force parts into place. A few of my diagonal braces were a bit snug, but I wouldn’t say I had to force any of them. Also, the horizontal Number 32 pieces on either side of the doors should be easy to attach in a level and straight manner. I’m worried that your doors won’t operate correctly, and your panels may not fit into the openings, if the frame has somehow been assembled so things are a bit out of square. The good thing is, I think you will likely be able to correct most problems by unbolting and rebolting parts. If you can, it’s best to correct this problem now, before going any further. 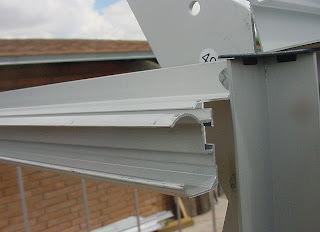 It’s especially to make sure that all of the vertical parts are truly square and plumb (use a level) before you start bolting on any of the diagonal braces, since the diagonal braces start locking everything in place. So, I’m hoping you can loosen and/or remove some bolts, and possibly remove some diagonal braces, and try to find out which pieces have gotten out of square. Problems can also be caused by starting with a foundation that is not quite level. If this is the case, it will be hard to correct the problem. If you do some checking and find that your foundation is the start of your problem, you might try fitting in a few panels to see if they will fit correctly in the openings, to see if you can live with things being a bit off. I still worry that you might have problems with the doors sliding smoothly though, if things are not very square. I don’t seem to have a photo of the area you mention (bottom of studs 28 or 29 where it joins plate 1a or 1b.) If you would like to send me an email at mudhouse@q.com, I’d be happy to try to help, and perhaps I could take a photo to send to you. My previous post on the bolts required for studs 16 and 17 was a little un-clear. What I should have said is from the bottom up there should be 4 long bolts and one short bolt at the top. Your drawing only shows three long bolts. Sorry for the confusion. Hi again Ted, you're absolutely right! I did leave out a long bolt in my list for the vertical back wall studs #16 and #17. In verifying this, I found I'd also made errors in the bolt list for the two center back #14 wall studs. Good grief. I'll redo the illustration ASAP. Thanks so much for alerting me. I really appreciate it when folks take the time to help me correct or improve info in the blog. Just a quick comment-rather than mucking around with bolt counts, I found it easier to just take a drill and cut holes in the channels of the studs approx 1/3 and 2/3's up. Used a bit just a little larger than the T head, which allows the insertion of bolts into the studs AFTER they're up-also good for adding carriage bolts later for shelving etc. Since you're only nipping the face of the stud, it doesn't affect strength at all. Another kind Harbor Freight greenhouse owner has just alerted me that they've made changes to some of the door parts, and my (older) manual actually doesn't even list the part 81 that you mention. She's sending me a copy of the new manual, because her version is even newer than the PDF file version that Harbor Freight has on their website. I've installed all the floor plates correctly, with all specified hold-down connectors. However when I tried screwing a corner post in place, the floor plate tips forward and comes off. The hold-down connectors are tight, but there's nothing to fasten the outer end of the floor plates, so they tip forward and come off. Could bolt the floor plate down with a filed-down bolt head? I am in a high wind area and need max strength. God Bless you for creating this blog. The pictures are immensely helpful! The back wall connector for the studs particularly had us stumped- just doesnt look right doing it the way the manual says. Glad to see it wasn't just us. Also, none of our #30 braces had any arrows on any of them. We had to assemble by trial and error. Hello Mark, sorry to hear about the missing part 48s. We measured ours for you. Part 48 is 4 3/8" long, and 1 1/8" wide; u-shaped, with small side flanges that hug the sides of the vertical posts. The side flanges are only about 1/4" long. There are four holes. The top and bottom holes are positioned so the center of the hole is 3/8" from the edge. The distance center to center between the holes is 1 3/16". I haven't graphed this out on paper, but we think it's very close. I can send you a photo of Part 48 installed, if you will drop me an email at mudhouse@q.com, if that helps. Great information. Your instructions are far better than the instructions that come with the kit. I do have some solutions of problems I encountered that you do not cover. My kit appears to be a combination of two different versions of this model. It drove me nuts until I finally got out the tape measure and found corner post 7 have the brace holes drilled in different spots on two of the post. Brace 30 touch each other when installed on one side of the green house, as shown in your picture, but on my kit, the other side has the braces parallel with an inch gap between braces 30 due to the holes being drilled in different locations on that side. None of the Brace's 30 had the arrows designating which end goes against post 7. Measure the distance from the end of the brace 30 to the center of the first bolt hole. The end measuring 23 3/8 inches is the end that goes against post 7 and against Crown Beams 8 & 9. Mark them with a pencil when you unpack them to save time later. Diagonal corner brace 80 does not have a center hole for the SDS bolt shown on your diagram. Leave the SDS bolt out if your kit does not have the center bolt hole in brace 80. The bolt has no purpose without a hole to bolt it through. And finally, the dreaded rear wall braces 31 simply could not be installed without pulling the side walls in 1/2 inch. Every way I attempted to attach the braces 31, they pulled the walls out of square. I finally purchased a 16 ft. 1/8 inch thick piece of aluminum angle iron ($12) and cut it 114 & 7/16 inches long, clamped it into position resting on top of side braces 80. Then I drill 1/4 inch holes in the appropriate places using the bolt holes in post 7 and the slots in post 14 as guides. Everyone should plan on this remedy if your kit will not stay square when attaching braces 31. The remaining 6 ft. of aluminum angle iron was clamped over the inside of the door arch and drilled and bolted to the door arch to make it rigid. And as other people reported, I was short a dozen bolts. I found 10 mm. stainless steel hex head bolts will slide down the groves in the side post 14 and rafters 15 and lock in place when the nuts are tightened. I bought the SS bolts locally because I did not want to wait for a delivery of more bolts from HF. Mutte, thank you so much for writing such a comprehensive post, with information to help others. Wow, it sounds like HF has really added some new problems to the kit. I know they have rewritten the manual several times since I wrote this blog, but I was hoping things were getting better. I know it's been confusing to have two different HF model number versions of the 10x12 kit. I've had folks contact me with problems that indicate HF shipped the wrong 10x12 manual with their kit. There are some changes to parts, so it has been confusing, but at least that can be remedied by downloading the other manual from the HF site. Now it sounds like they are mixing up the parts, between the two versions of the kit...? That's terrible. I appreciate the heads up, and if folks contact me with the same problems you mention, I'll be able to send them the solutions you posted here. I hope the rest of your greenhouse experience goes smoothly for you, now that you've survived the build. I made an error on my previous post. I said to cut the aluminum angle iron 114 & 7/16 inches. It should be 117 7/16 inches. I must have been having a senior minute. Hi.... your pics and explanation are great. NONE of my cross braces have arrows, any idea on what I should do?? 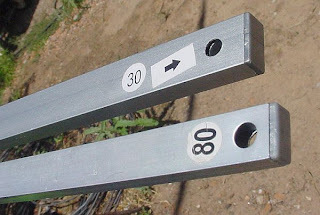 "None of the Brace's 30 had the arrows designating which end goes against post 7. Measure the distance from the end of the brace 30 to the center of the first bolt hole. The end measuring 23 3/8 inches is the end that goes against post 7 and against Crown Beams 8 & 9. Mark them with a pencil when you unpack them to save time later." My newest version of the manual still refers to the arrows marked on the pieces. Harbor Freight has dropped the ball on this one, I fear, if they've stopped marking the braces with arrows. It's been too many years since we built ours to be conversant on this issue, so I'm hoping Mutte's tip above will help. Mudhouse.... Thank you very much. I completely missed the comment about it prior to making my comment. Again, thank you. 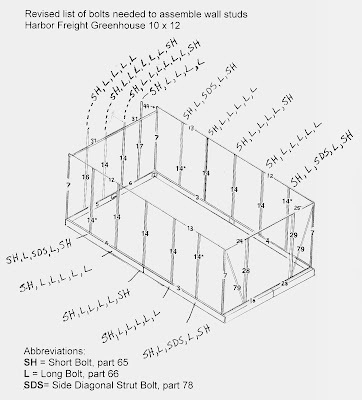 I'm picking up the 6x8 greenhouse from Harbor Freight today. I hope all goes smoothly. Is there any tips for the 6x8 size? Wish us luck! I think you may also find more information, including some YouTube videos, if you Google Harbor Freight 6x8 Greenhouse. Anyone had problems with sliding the bolt heads into the slots on the wall studs? (14-17 )Ours do not fit without force, should we return? I have not had reports of this problem so far, and I hope this is not a new wrinkle in the HFGH kits. Just to be sure we're talking about the same thing...the bolts must be slipped into the tracks on the ends of Parts 14-17, ahead of time, before you finalize the frame assembly. The idea is the bolts are sitting (waiting) in the track of the posts and rafters, ready to be attached to braces, etc, later as the instructions dictate. You can't insert a bolt into the middle of the track on these pieces at a later time without a lot of trouble (or some judicious grinding) because the bolt heads are designed to be too large. They have to be slipped into the end of the track. This is so the bolts can't be pulled out of the tracks, once inserted. But this design also means that inserting the right number of bolts into each post or rafter is critical...which is why it was such a pain, when HF had these instructions wrong, in the early manuals! If you mean the bolt heads are too large to be slid into the opening on the ends of Parts 14-17, it is indeed a new wrinkle, for me. I guess it's possible that the Parts 14-17 have been poorly extruded in such a way that there's a burr of metal left of the very end of the track...? Which might prevent you from easily slipping the bolt heads in...? But we have not seem this type of poor manufacturing on any of our own Harbor Freight parts, so I'd be kind of surprised if this was the problem. Please feel free to post back, or email me directly at mudhouse@q.com if I can be of further help! I will be happy to try to help you figure this out. Yes the picture on this post clearly states the bolts sitting freely in the track. Also if you look at the picture I'm referring to it shows the bolts fitting in with flat side up, ours is way too small to get them in that way it's more narrow going up and down. Ours, on the other hand, the bolts don't fit in either side of 14-17. Sadly it must be a defect because we have tried everything. Nobody else seems to have problems with this that I have heard of. Thank you for responding so quickly, I appreciate it! If you have any other tips feel free to comment back, but we have tried almost everything there is to try. I believe it is indeed a new wrinkle and we were told to return it. Thank you. This is so hard to figure out using typed words! I wish I could be more help. If you've already been encouraged to return your kit, it sounds like you're on your way to a resolution. I checked and found a few extra bolts from our kit (eight years old.) Our bolts, if it helps, have a square shaped head (square with rounded corners) and the heads measure 3/8" by 3/8". I'm not sure this will help you, but I'm wondering if Harbor Freight included the wrong bolts with your kit. If they have changed them (which is possible) this is the first mention I've had of it. In any event, I do appreciate your post, as questions like this help give me a valuable "heads up" about problems that others might encounter. If you have the same problem with the exchanged kit, I hope you will post back. First, thank you for taking the time to do this! I have greatly appreciated the guide. I just wanted to let you know that the arrow stickers on our wall braces (part 30) were all on the wrong end. So, after fighting with one side for twenty minutes, we switched them around and they went together perfectly. So, just in case anyone is having trouble lining up the holes on the wall braces, that could be the problem. Thank you Lori! I'll bet your comment will help others here. We had a post almost a year ago (Mutte, listed above) specifying that the Part 30 wall braces didn't have any arrow stickers at all. It sounds like Harbor Freight is STILL having problems, marking these Part 30 braces correctly. I'm glad you were able to experiment and figure out the problem. Best of luck with your build, and thank you again for posting about this problem!